You might not be aware of the fact that permanently deleting any data from your Hard Disk drive or partition doesn’t delete it. Though you cannot access the deleted files directly from your system, it can be easily recovered by the File Recovery softwares. The problem mainly arises when you are working on a system in any corporate firm or company. The worst-case scenario would be that you might give out the access of some secured and confidential files to an outsider with security compromises and data leaks. It does happen quite often when the companies upgrade their hardware and storage devices like USB drives, memory cards, etc. Most of the data is recovered using various data recovery software and tools that are available on paid or free basis. Similarly, there are other software or the counter tools that can help you permanently clean your storage drives by shredding the partitions or wiping them. Today, I am going to review a similarly useful hard drive wiper that can be helpful in various situations. 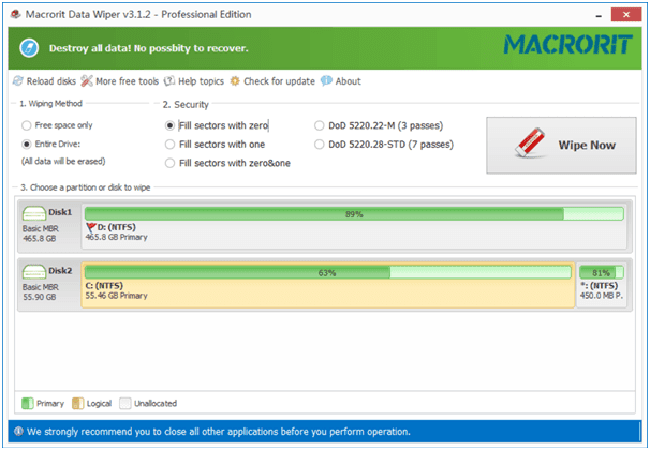 So, without any further talks, let’s get started with the review of Macrorit Disk Partition Wiper Pro. Just as the data recovery software are entitled to recover any deleted data, data wipers and shredder make it almost impossible to recover any data from internal storage drives and external devices like memory cards, USB drives, and External Hard disks. Luckily, Macrorit Disk Partition Wiper is one of the most premium and easy to use hard drive wipe and data shredder software for every Windows User. Being a geek, I’ve always experimented with multiple disk management software and trust me on this; one simple click can make you lose all your precious movies collection instead of shredding the other partition. Being a victim, I don’t want you guys to face the same issue. That’s why I am recommending Macrorit Disk Partition Wiper Expert over any other tool. Two main reasons behind this are the ease of use and a very friendly user interface for all the noobs. Being a premium software, the company but obvious also offers a free version for the same. Though it is not much of use, you’ll easily get the idea of what all the exclusive features Macrorit Disk Partition Wiper holds. The trial is available on the official website and can be downloaded for all the latest Windows versions, Server, etc. The setup only takes few seconds to install, and within a few clicks, you’re all set to wipe. The software has a smart algorithm that initially performs all the function virtually. In simple words, every change or alteration you make to the partitions or external drives are first displayed virtually on a preview basis which lets you decided the outcomes. Also, the process the pretty lengthy so the software provides you with an option which automatically turns off the system after the process. You can purchase the standard Pro edition for a price of $29.95 which supports only one computer. You’ll get Lifetime of free upgrades and customer support for any troubleshooting, query or any doubt. Moreover, the Unlimited Edition is available for a discounted price of $99.95 which supports an unlimited number of machines for one registration. You can get more information on the Macrorit Wiper website. Works well with Internal as well as external drives. Dual Confirmation features for accidental deletion. Program can be easily operated on portable basis. Trial version limits the main features. Limited to Windows operating system only. In simple words, if you are looking for a data destruction program that is capable of erasing any drive, irrespective of its size, file formats, etc. then Macrorit Disk Partition Wiper is the one. Using the software is laid-back, and you’ll get the hold of every option within few minutes. The cons can be easily ignored as it is a premium software. 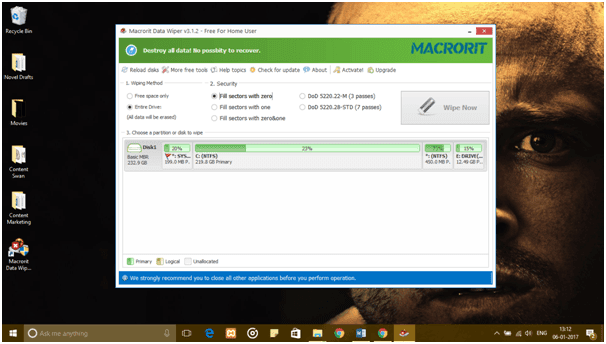 Macrorit Disk Partition Expert is perfectly suitable for network administrators and IT firms who deal with a lot of data on the temporary basis. Moreover, Macrorit also offers a disk manager variant that can be used to transfer GBs of data from one partition or drive to another. Do share your thoughts on the software and let me know if you’ve tried the trial version for wiping any drives in the comment section below. Cheers!